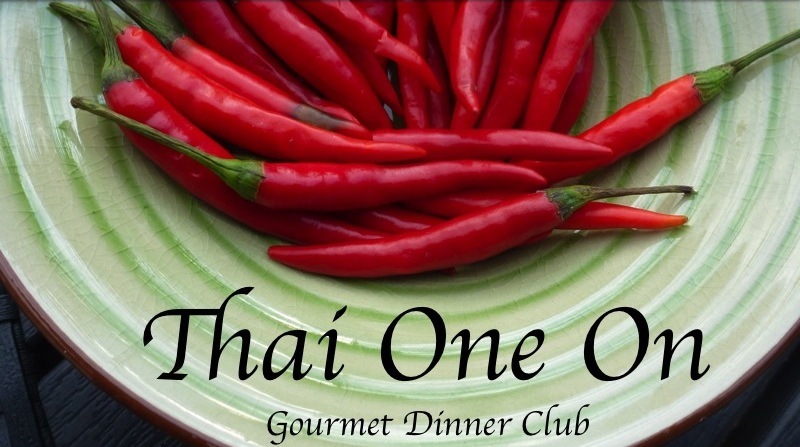 Thai One On in my Gourmet Dinner Club menu from Thailand. Many people love Thai food and much of it is naturally gluten free making this an excellent choice for your next dinner party. The sooner you get planning your dinner with friends the sooner it will happen. 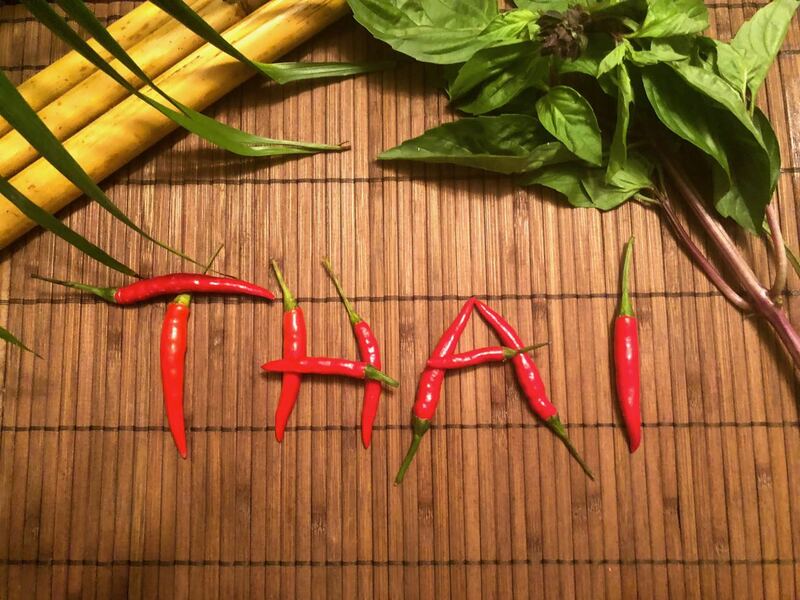 Tantalizing Thai curries showcase the subtle blends of cilantro, chiles, lemongrass, galangal, ginger and lime. Pungent fish sauce is in almost every dish and coconut milk is added to most curries as well as to the fragrant Jasmine rice. Other flavours include ginger, basil, shrimp paste and tamarind. Thai food is a delicate balance of sweet and sour with the hot and the salty. The dishes are all served together and complement each other in a harmonious layering of flavour upon flavour. Typically diners combine any of the dishes and condiments to achieve the desired taste. For ideas to organize your own Dinner Club read this post, How To Start a Gourmet Dinner Club. My Thai menu is a starting point, substitute with old favourite recipes but challenge yourself to try something new as well. Choose whatever excites you and create culinary adventure that suits your interest and meets your dietary needs. This post may contain affiliate links. When you purchase using these links your cost is the same, but I receive a few cents for every dollar spent. I appreciate your support for this website. As they say in Thailand…Gan gin gan yu – as you eat, so you are. In each recipe description I share tips on using or buying the ingredients. When I host a cooking class I like to give participants a handout with an overview of the common ingredients for that cuisine. To me part of the fun of a Gourmet Dinner Club is discovering ingredients you are not familiar with or challenging yourself to try techniques you have never tried before. Below is my Intro to Thai Ingredients handout. In my ladies Gourmet Dinner Club we have learned many traditions and customs from cuisines around the world but when it is time for menu planning the host gets to do exactly what they want. Please let me know in the comments below what you made for your Thai menu and if you found this ingredient list helpful. A Thai menu will use these ingredients readily available in Chinese and Asian grocery stores as well as supermarkets with an extensive Asian section. These are all naturally gluten free. CILANTRO – Now readily available fresh this is the preferred way to use it although it is also sold dried and in a paste. Cilantro is sometimes called Chinese parsley. Fresh cilantro can be chopped and frozen. In Thai cooking the stems of the cilantro are often used for curry paste. The dry seed of the plant is sold whole or ground and is generally called coriander in this form. COCONUT MILK – Considered the milk of Southeast Asia, coconut milk is indispensable in most Asian cuisines. It is made by steeping grated coconut in warm water then straining it through cheesecloth. Coconut milk is not the watery liquid inside a fresh coconut. Available in cans in grocery stores but is generally less expensive in Chinese and Asian grocery stores. Shake well before opening and stir after opening. Fat content and taste varies among brands. FISH SAUCE – Called nam pla in Thai and nuoc mam in Vietnamese. This is the ubiquitous Thai and Vietnamese condiment used in almost every dish, just as salt and soy sauce are used in other cultures. Completely natural, it is the clear, amber-coloured liquor that runs off when small fish are packed in wooden barrels with salt and fermented for a few months. Some brands are saltier than others so always taste your finished dish and adjust accordingly. It will keep indefinitely without refrigeration. GALANGAL – Also called laos root, galangal is botanically part of the ginger family. Fresh galangal has a mustardlike, piney taste and is much hotter than ginger. It can be difficult to find fresh but is available frozen (whole, like a piece of gingerroot) and dried (in slices). LEMONGRASS – Long stalks that look like gray-green, woody scallions. The bulb-like base of the stalk is used, sliced or coarsely shredded. Common in Thai, Vietnamese and Indonesian cuisines. Also available in packages of dried pieces, dry powder or finely grated/chopped and frozen. SHRIMP PASTE – Called terasi in Indonesian and kapi in Thai. This pungent smelling paste is made from fermented shrimp. 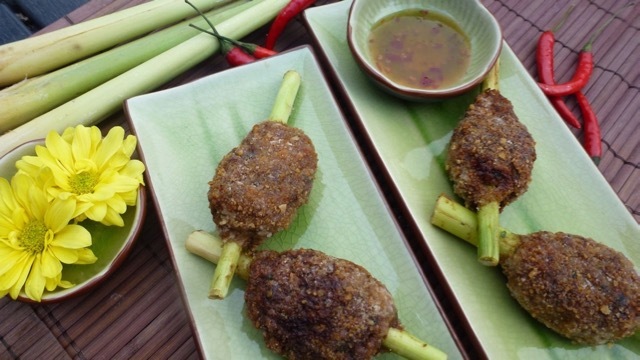 Like fish sauce it is an essential contributor to the unusual flavours of Thai cuisine. TAMARIND – It has an unusual sour flavour which lends a unique taste to both sweets and curries. The seeds from this Asian pod are usually made into a concentrate or packed like dates, shelled but still containing some fibres and seeds. For the concentrate; use 1 part concentrate to 2 parts water. For the packaged tamarind pour boiling water over the pulp (2 parts water to 1 part pulp), stir then push through a sieve to get a paste. This can then be frozen in small amounts for future use. THAI BASIL – Fresh Thai basil is distinctively different from European basil so should not be substituted. Thai basil comes in many varieties. Substitute fresh cilantro in cooked dishes or fresh mint in salads if Thai basil is not available. The taste will be different but you will have a more authentic Thai flavour. In the spring several varieties of Thai basil are sold at garden centers so buy some for your patio or garden. THAI CHILES – Also called bird chiles these are small and fiery hot. Can be frozen and used right from the freezer. You may want to wear gloves when seeding and chopping chiles. Substitute jalapeno or serrano chiles according to your taste. Some Thai cookbooks suggest using four times the amount to get the same intensity of heat. I suggest starting with an equal amount and adjust from there. From time to time I write a travel post for my friend Sue over at Travel Tales of Life. This is the one I wrote about our trip to Thailand many years ago. I agree Wendy, the trip was worth it and your tamarind paste will last you a year at least. Funny how some recipes stand the test of time, 30 years later they are still delicious. (I also make the mistake of not wearing gloves…all the time. Those chiles are small but they’re hot! Mmmm. I love Thai food. I have to drive to Kelowna for tamarind paste but so worth it. I have a Thai cookbook published about 30 yr ago by Thai airlines and I still make several favourites from it including one I made last night, chicken with fried garlic and chilies. Silly me, forgot to wear gloves, my hands are still burning. Listen to my interview on A Canadian Celiac Podcast – http://bit.ly/Ep46CindeLittle. Subscribe and listen to stay up to date on all things gluten free.